Day two in Eugene began with coffee (of course) and a run on Pre’s Trail. Pre’s trail: Miles of wood chip trails, hundreds of runners out doing “work”. Can you say paradise? Pete and I were supposed to meet up with the Oiselle group at 9:30 but we overslept and missed running with them. It was probably a good thing considering I felt like trash, and I was in full-on zombie mode by the time got to Starbucks for breakfast. The food worked it’s magic thankfully, because we didn’t have much time to get ready for the track. Day Five was packed with events, and we had to hurry to meet everyone at the Oiselle house for a short walk to Hayward. 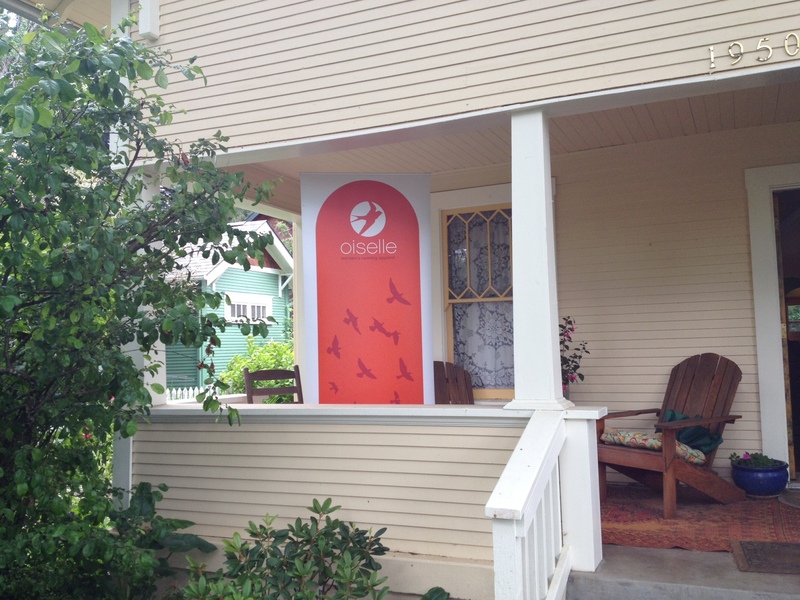 Front porch of the Oiselle HQ house at the Trials! On our way in, we ran into Mark, my JMU coach’s son who now coaches the Oregon Track Club Elite. We didn’t get to chat long, because he was apparently bringing Andrew Wheating his jersey. I guess he forgot his. Good to know that even pro runners make the same mistakes as my high school cross country kids. After a few uneventful qualifying rounds, the real action was about to be ON. THE. TRACK. Start of the Men’s Steeplechase Final. 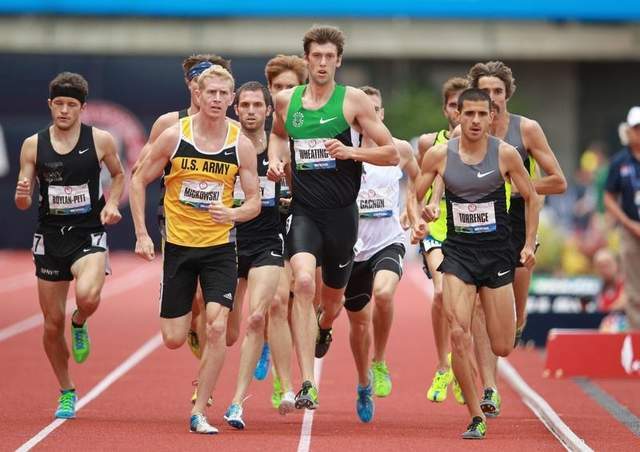 The team going to London included some of the favorites, but a few surprises: Evan Jager, Donn Cabral, and Kyle Alcorn. Two laps to go! Dan Huling, one of the favorites, faded during the last lap and ended up seventh. The most exciting races of the night were yet to come. I was so engrossed in the actual races that I didn’t get to take many pictures, but here are a few. Early in the race. Eventual surprise 3rd place finisher Kim Conley of New Balance is leading. 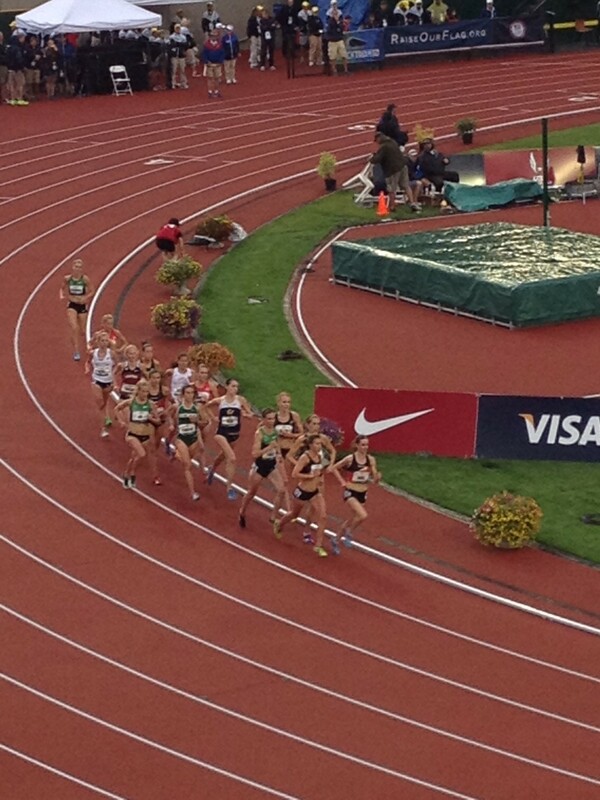 About midway through the women’s 5k final. The top three eventual finsihers are leading here, but Julia Lucas (in fourth on the outside) is getting ready to make her move. I was mostly focused on cheering for Lauren Fleshman, and in my heart I was rooting for Julia Lucas as well given her struggles over the past few years. So when Julia Lucas made a decisive move for the front I was excited for her. 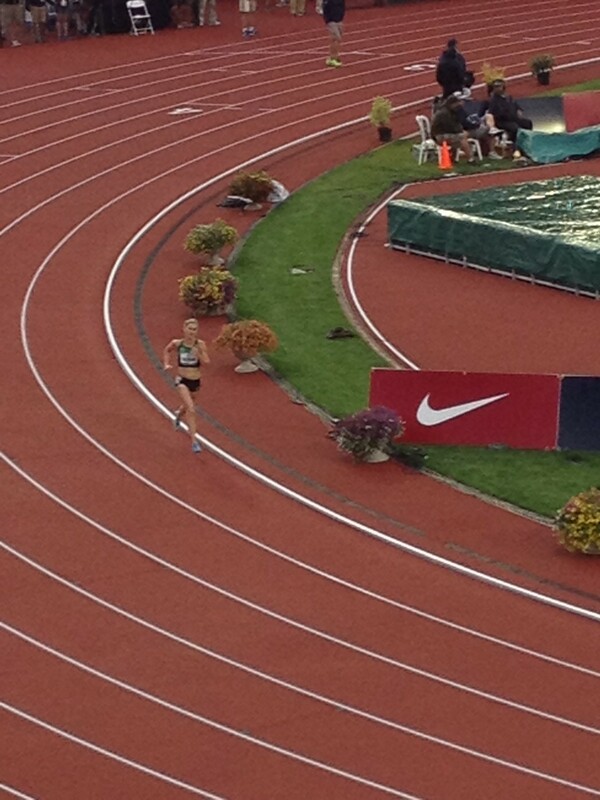 Lauren Fleshman in the women’s 5k final. “C” for Courage. It was inspiring to watch Lauren racing, gritting it out on her 10 miles per week of training and showing some serious courage. The finish of the race came as shock to many. Julia Lucas faded badly down the home stretch and was beat to the line by four one hundreths of a second. Kim Conley had run 15:19.79, just under the Olympic A standard of 15:20.0 and was on her way to London along with Molly Huddle and trials winner Julie Culley. 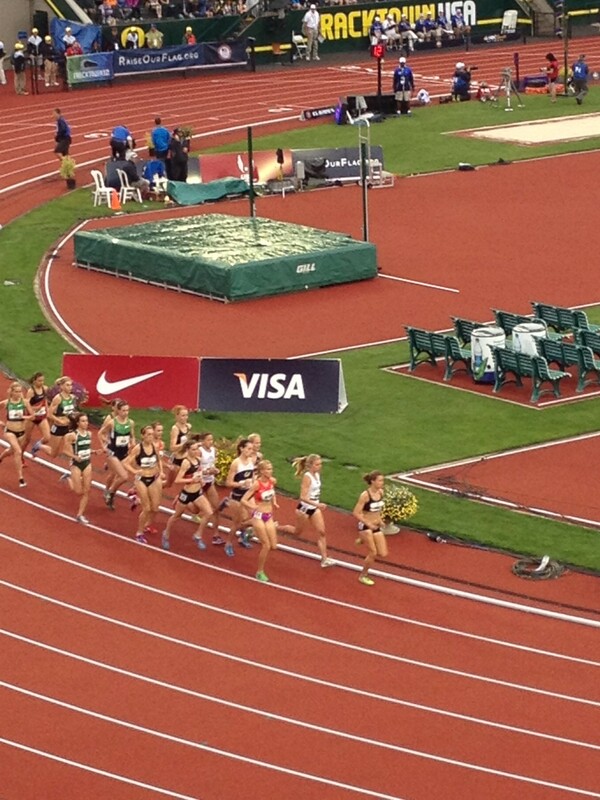 The women were a tough act to follow, but the finish of the men’s 5k was thrilling to say the least. 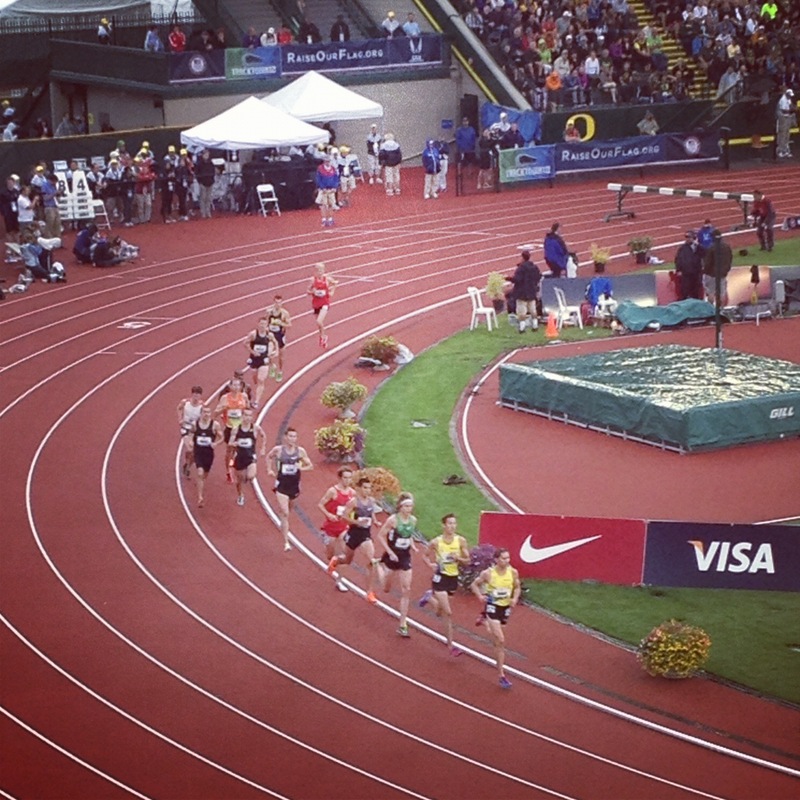 Galen Rupp broke Steve Prefontaine’s meet record from July 9, 1972 and finally defeated Bernard Lagat in the process. 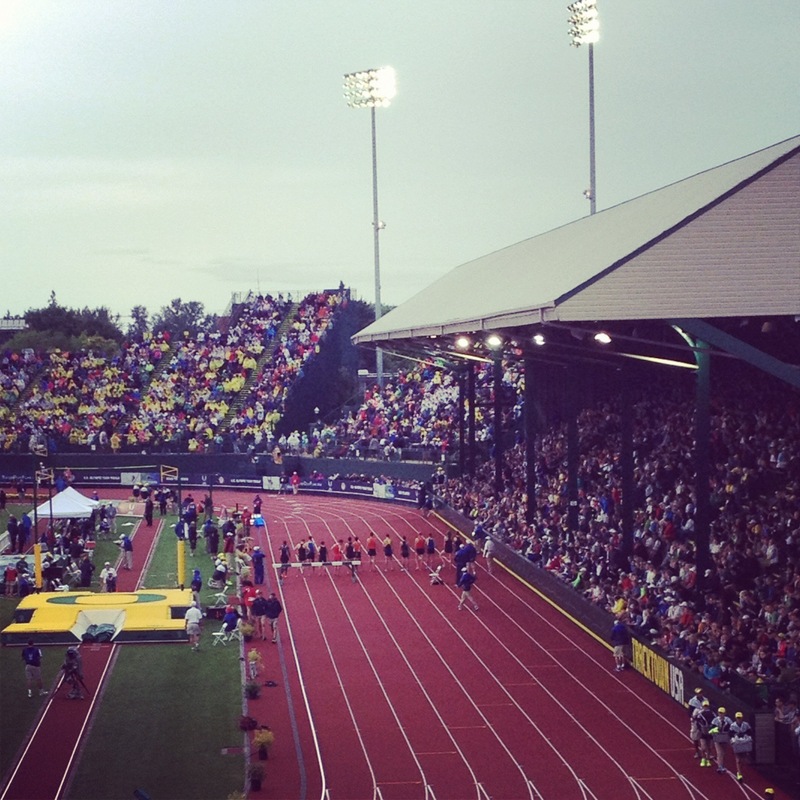 The men’s Olympic 5k team of Rupp, Lagat, and Lopez Lomong will be one of our strongest ever. I didn’t get to take any pictures of the men’s 5k, mostly because I was so hyped up after the women’s race and also because we had to hurry out to meet my cousin and her husband for dinner. 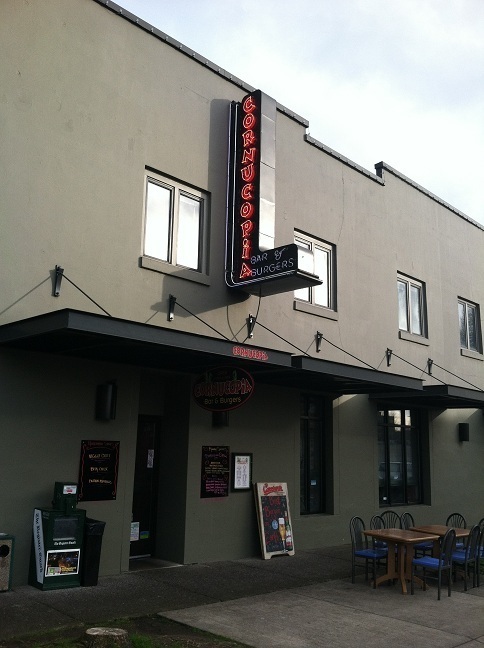 Cornucopia had amazing burgers and craft beers. Yum. We were starving. 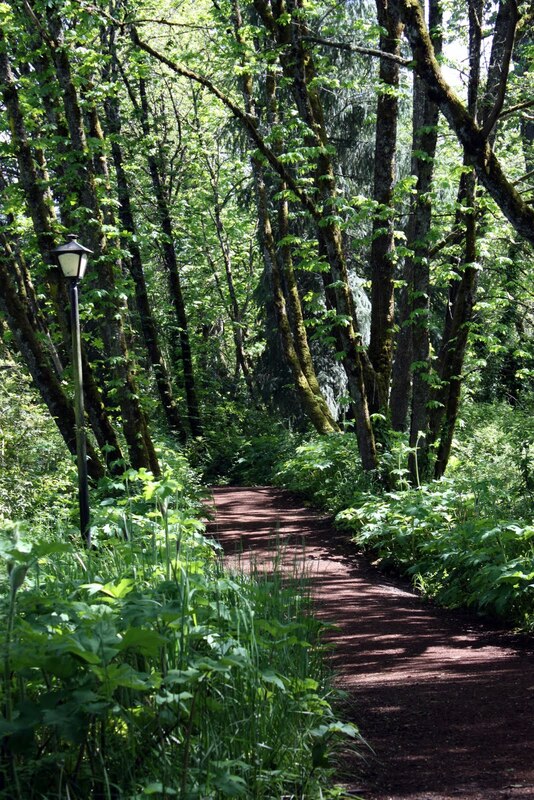 Great photos – that trail looks fabulous!